Russian Karaite archeologist; born in Lutsk, Volhynia, Sept. 27, 1786; died in Chu-fut-Kale, Crimea, June 7, 1874. He was educated as a Karaite scholar, but later paid much attention to rabbinical literature, by which his Hebrew style was influenced. 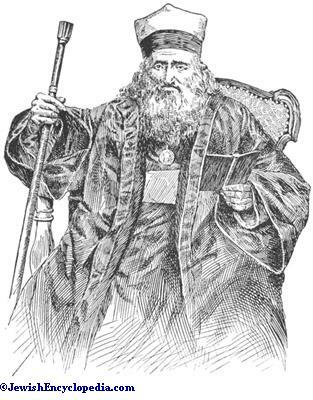 In 1818 he was ḥazzan of his native city, an office which among both Karaites and Rabbinites includes that of cantor, reader, teacher, and minister. In 1828 he lived in Berdychev, and had controversies with some Rabbinite Jews, the result being his anti-rabbinical work "Masah u-Meribah" (Eupatoria, 1838). In later years when he became closely connected with the Rabbinites, he repudiated the sentiments contained in that pamphlet. In 1830 he visited Jerusalem, where he collected many Karaite and Rabbinite manuscripts. On his return he remained two years in Constantinople, as teacher in the Karaite community. He then went to the Crimea and organized a society to publish old Karaite works, of which several appeared in Eupatoria (Koslov) with comments by him. In 1838 he was the teacher of the children of Simḥah Babovich, the head of the Russian Karaites, who one year later recommended him to Count Vorontzov and to the Historical Society of Odessa as a suitable man to send to collect material for the history of the Karaites. In 1839 Firkovich began excavations in the ancient cemetery of Chufut-Kale, and unearthed many old tombstones, some of which, he claimed, belonged to the first centuries of the common era. The following two years were spent in travels through Caucasus, where he ransacked the genizot of the old Jewish communities and collected many valuable manuscripts. He went as far as Derbent, and returned in 1842. In later years he made other journeys of the same nature, visiting Egypt and other countries. In Odessa he became the friend of Bezalel Stern and of Simḥah Pinsker, and while residing in Wilna he made the acquaintance of Fuenn and other Hebrew scholars. In 1871 he visited the small Karaite community in Halicz, Galicia, where he introduced several reforms. From there he went to Vienna, where he was introduced to Count Beust and also made the acquaintance of Adolph Jellinek. He returned to pass his last days in Chufut-Kale, of which there now remained only a few ruins. The discoveries made by Firkovich, which were first announced to the world in Pinner's "Prospectus" (Odessa, 1845), gave rise to a whole literature. The collection of stones, facsimiles, manuscripts, and molds taken from tombstones, which was acquired from Firkovich by the Imperial Library of St. Petersburg, on the recommendation of Professor Chwolson in 1859, was declared by some authorities to consist partly or wholly of forgeries committed for the purpose of glorifying the Karaites and of enhancing the value of Firkovich's discoveries. As the full extent of his forgeries will probably never be known, a list of the genuine and the spurious in the collection is therefore impossible. 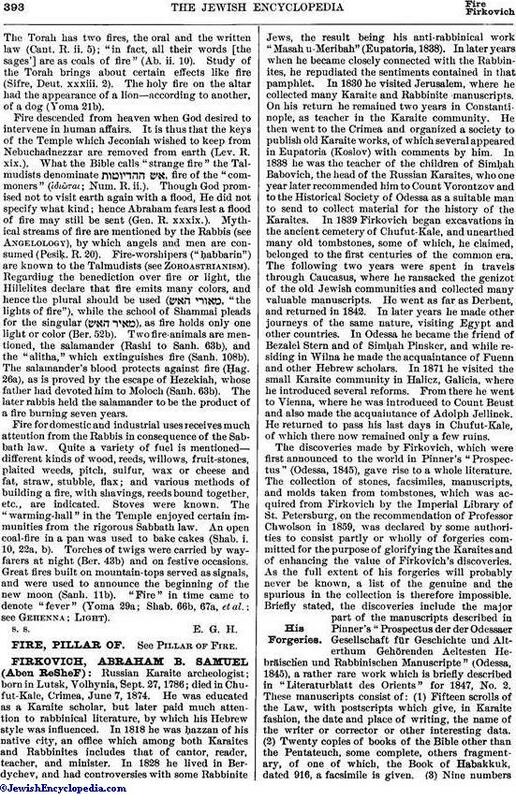 Briefly stated, the discoveries include the major part of the manuscripts described in Pinner's "Prospectus der der Odessaer Gesellschaft für Geschichte und Alterthum Gehörenden Aeltesten Hebräischen und Rabbinischen Manuscripte" (Odessa, 1845), a rather rare work which is briefly described in "Literaturblatt des Orients" for 1847, No. 2. These manuscripts consist of: (1) Fifteen scrolls of the Law, with postscripts which give, in Karaite fashion, the date and place of writing, the name of the writer or corrector or other interesting data. (2) Twenty copies of books of the Bible other than the Pentateuch, some complete, others fragmentary, of one of which, the Book of Habakkuk, dated 916, a facsimile is given. (3) Nine numbersof Talmudical and rabbinical manuscripts. The account of the contents of his second and more important collection, which he sold for a very large sum to the Imperial Library of St. Petersburg in 1862-63 (see Fürst, "Geschichte des Karäerthums," iii. pp. 174 et seq., Leipsic, 1869), gives more than 700 numbers of various Karaite and Rabbinite manuscripts. Another collection of 317 Samaritan manuscripts, acquired in Nablus, arrived in the St. Petersburg Imperial Academy in 1867 (ib. p. 176). S. L. Rapoport has pointed out some impossibilities in the inscriptions ("Ha-Meliẓ," 1861, Nos. 13-15, 37); Geiger in his "Jüdische Zeitschrift" (1865, p. 166), Schorr in "He-Ḥaluẓ," and Neubauer in the "Journal Asiatique" (1862-63) and in his "Aus der Petersburger Bibliothek" (Leipsic, 1866) have challenged the correctness of the facts and the theories based upon them which Jost, Fürst, and Grätz, in their writings on the Karaites, took from Pinsker's "Liḳḳuṭe Ḳadmoniyyot," in which the data furnished by Firkovich were unhesitatingly accepted. Further exposures were made by Strack and Harkavy (St. Petersburg, 1875) in the "Catalog der Hebr. Bibelhandschriften der Kaiserlichen Oeffentlichen Bibliothek in St. Petersburg"; in Harkavy's "Altjüdische Denkmäler aus der Krim" (ib. 1876); in Strack's "A. Firkowitsch und Seine Entdeckungen" (Leipsic, 1876); in Fränkel's "Aḥare Reshet le-Baḳḳer" ("Ha-Shaḥar," vii. 646 et seq. ); in Deinard's "Massa' Ḳrim" (Warsaw, 1878); and in other places. Chwolson alone defended him, but he also was forced to admit that in some cases Firkovich had resorted to forgery. In his "Corpus Inscriptiorum Hebraicarum" (St. Petersburg, 1882; Russian ed., ib. 1884) Chwolson attempts to prove that the Firkovich collection, especially the epitaphs from tombstones, contains much which is genuine. 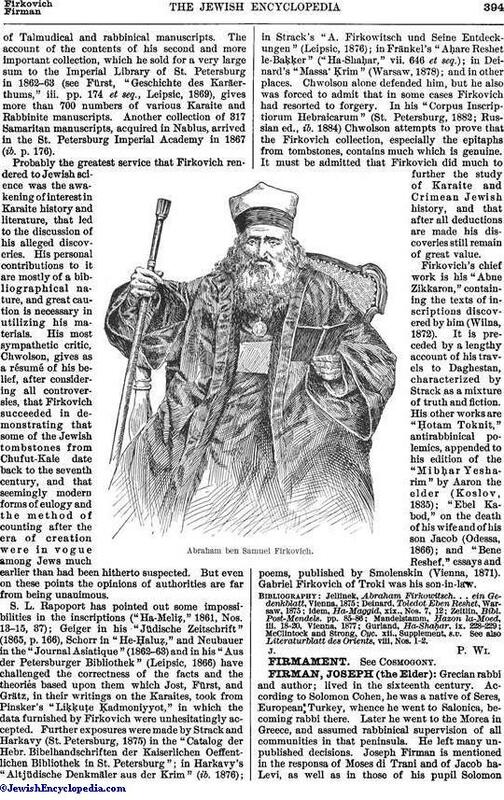 It must be admitted that Firkovich did much to further the study of Karaite and Crimean Jewish history, and that after all deductions are made his discoveries still remain of great value. Firkovich's chief work is his "Abne Zikkaron," containing the texts of inscriptions discovered by him (Wilna, 1872). It is preceded by a lengthy account of his travels to Daghestan, characterized by Strack as a mixture of truth and fiction. His other works are "Ḥotam Toknit," antirabbinical polemics, appended to his edition of the "Mibḥar Yesharim" by Aaron the elder (Koslov, 1835); "Ebel Kabod," on the death of his wife and of his son Jacob (Odessa, 1866); and "Bene Reshef, "essays and poems, published by Smolenskin (Vienna, 1871). Gabriel Firkovich of Troki was his son-in-law. McClintock and Strong, Cyc. xii., Supplement, s.v. See also Literaturblatt des Orients, viii, Nos. 1-2.